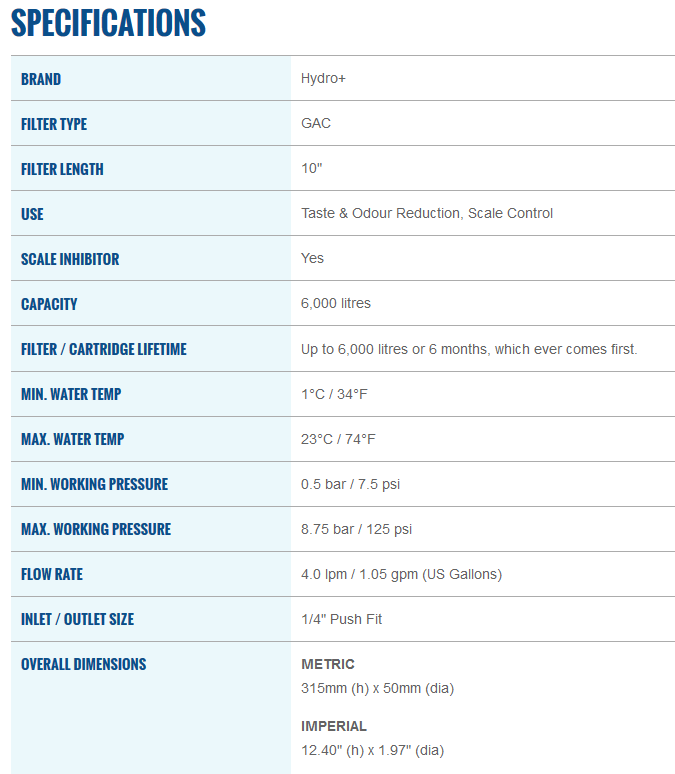 The H11PA filter is similar to the H10PA but with the inclusion of a scale inhibitor medium. It has a capacity of up to 6,000 litres; integral 1/4" push-fit connections and is suitable for use as an inline fridge filter, water cooler or under-sink filter. Lamona HK1032/SAMSUNG DA29-10105J /SAMSUNG WSF-100/LG BL9808 Easy Water Filter/SAMSUNG MAGIC WATER FILTER/DAEWOO DD7098/HOTPOINT BL9808/GXRTQR/QXITQR/GXITQ /B&Q AQUASHIELD FILTER/OPELLA AQUASHIELD FILTER /WICKS INLINE FILTER/WHIRLPOOL/SCREWFIX FILTERMATE FILTER/LG 9808 BL9303, among many other models of filters. Click the button below to add the Hydro+ H11PA - GAC and Scale Inhibitor Inline Filter with 1/4" Connectors to your wish list.